What Is The Recovery Period After Wisdom Tooth Extractions? The Recovery period after removing Wisdom teeth can be as little as 1-2 days of moderate soreness with intermittent throbbing pain. The soreness and throbbing pain will decrease to minor soreness from days 3-7. The soreness and throbbing is usually controlled by prescription strength Ibuprofen and pain medication. The Wisdom Tooth Removal Technique used by the Dental Surgeon is a huge factor in the Recovery Period After Wisdom Tooth Extractions. It is best to plan to rest for 2 days after wisdom teeth extractions where it is not necessary to work or engage in heavy activity. Wisdom teeth are best removed between the ages of 14 and 25 years of age. Generally the pain after extractions is greater in patients where there is pain and swelling present prior to tooth removal. Tooth extractions also becomes more difficult with increased age. Wisdom Teeth Removal is one of the most common Dental Surgeon procedures we perform in Rockville Maryland. When Wisdom Teeth are removed, it is best to remove all four teeth at once. Usually all four teeth need to be removed and it is not a fun experience. The pain, swelling and healing time after wisdom teeth extractions is usually the same whether one or all four of the teeth are removed. Unless there is a good reason, such as severe swelling and infection of one tooth, it is best to remove all four of the wisdom at once. Platelet Rich Fibrin or PRF dramatically decreases the chance of Dry Socket, Pain, Swelling and Jaw Bone infections that can persist after oral surgery. 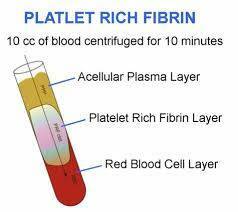 PRF is prepared by spinning the patients own blood in a centrifuge and isolating the PRF which is a thick yellow jello-like isolate. During Wisdom Tooth Removal Surgery, jaw bone is exposed. In bone there is very little blood supply as compared to other tissues in the human body. In areas where there is little blood, the body has less ability to heal quickly and less defense against infection. We place PRF into tooth wisdom tooth extraction sites. In the absence of the PRF, dental extractions sites are left to heal open to the oral cavity and there is a bony hole in the jaw bone. Saliva, bacteria and other contaminants are free to pour down into the jaw bone. When PRF is placed into the extraction site, the PRF protects the site from infection and enriches the area with Fibrin, Platelets, White Blood Cells and Bone Growth Factors that accelerate jaw bone healing. In Cases of very difficult removals, Natural Bone Grafts with PRF may be necessary. PRF for Dental Implants is also very helpful in decreasing the healing time after dental implant surgery. Some throbbing and aching pain controlled by prescription medications. Minor bleeding of extraction sites after rinsing, eating and drinking. Minor bruising and swelling both inside and outside of the mouth. Notify your Dental Surgeon if there is significant and persistent bleeding or moderate to sever swelling. Notify your doctor if you get severe nausea or any severe swelling of your tongue, throat or rash and hives. Throbbing and aching pain will give to soreness. There may be some general jaw inflammation and deep discomfort. Jaw opening may be limited down to 60% of the normal opening. Be sure to rinse with warm salt water and keep food particles out of extraction sites. gently dab and brush at the extraction sites with a toothbrush (no toothpaste) in between saltwater rinses. 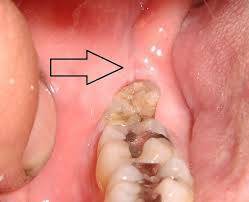 You may see a white or yellow tissue forming in the extraction site that has a fluffy appearance. It may be food particles, plaque or NORMAL Collagen formation. Collagen is what the body makes ahead of gum tissue. Light brushing and rinsing should remove plaque and food particles. Do not Force out the Collagen as it is protecting the site. If after rinsing and cleaning, you smell a persistent foul odor, notify your Dental Surgeon. Most Symptoms should subside except limited jaw opening and a minor, occasional ache. It may take 2-4 weeks to reach normal Jaw opening. If any stitches remain, you should return to your dentist to have them removed. During this period you should be able to stop taking the prescription medications. Some patients who bruise easily and who had pain before the extractions ( especially patient who received emergency wisdom tooth removal ) may have more pain for up to 10 days. It is very important to finish all antibiotic medications even if there is not pain. If Wisdom Teeth Healing does not follow the schedule above, and especially if there is not progress after days 3-4 and the pain even worsens, you should call you Dental Surgeon Immediately because you may have a Dry Socket. Dry Socket requires immediate attention and treatment by the Dental Surgeon. If you follow care instructions after wisdom tooth removal. 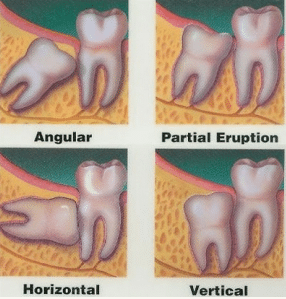 Different Kinds of Impacted Wisdom Tooth Removals: Angular vs Horizontal vs Vertical Wisdom Tooth Impactions. Partially erupted vs Complete Bony Wisdom Tooth Impaction. An Dental Surgeon can discuss the differences in the above cases. Often 2-3 days of recovery is needed before getting returning to daily routines. You may need an additional day or two to regain strength. During the first 24 hours, avoid any strenuous cardiovascular activity that could encourage bleeding from the extraction site, or interfere with the blood clot retention in the extraction site. 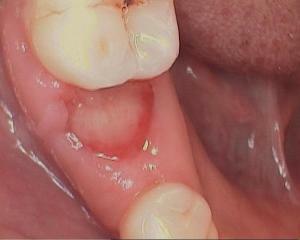 Disruption of the clot in the extraction site can cause a dry socket and delayed healing and pain. Avoid working out, athletic competition, band and choir participation for 3 to 4 days. If you feel tired, have increased pain, swelling, or bleeding, allow an extra day or two of light activity. If you had sedation dentistry, you need to be by another adult for at least 5 hours oral surgery. You cannot be left unattended. You may need assistance standing and going to the bathroom while you are still feeling the effects of the anesthesia. Do not drive, drink alcohol, or operate any kind of machinery for 24 hours after oral or IV Sedation Dentistry. You will receive written prescriptions. The worst discomfort occurs during the first six hours after the anesthetic has worn off. Take your medication while you are still numb. People do better when they take their medications on time and stay ahead of pain and swelling. It is possible that slight bleeding may reoccur especially after eating and drinking. If significant bleeding occurs, place fresh gauze packs or wadded paper towel over the surgical site that is actively bleeding and bite very firmly for thirty minutes. Avoid spitting or using straws, as they can cause bleeding by creating negative and positive pressure in the mouth. You can minimize swelling by using cold packs for the first 24 hours. This should be used next to the surgical sites 20 minutes on and 20 minutes off. Day one, do not brush, rinse or spit. Day two, brush your teeth with a soft toothbrush. You should also begin gentle rinses with warm salt water 2-3x per day (especially after meal time and before bed). Avoid smoking for at least 3 days and avoid chewing tobacco until the surgical sites are completely healed. Patients who use tobacco experience a longer recovery period and a higher level of complications. Yes, It is absolutely medically and dentally necessary to remove impacted wisdom teeth that are Impacted, Infected and damaging adjacent teeth. These same teeth cannot be cleaned, cause gum infections, tooth infection, jaw bone infection and root resorption of adjacent teeth and life threatening bone pathology. See the above picture. If your wisdom teeth are not impacted in soft tissue or bone, they may be able to be kept clean and healthy in the mouth. Not all Wisdom Teeth need to be removed. 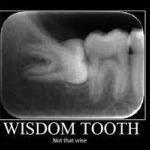 The Wisdom tooth is the third and last molar on each side of your upper and lower jaws. 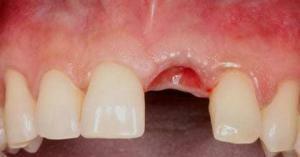 These teeth commonly come in the mouth in late teenage or early twenties and are the final teeth to erupt in the mouth. Wisdom teeth are the most common molars which fail to erupt in the mouth due to their far most location and reduced jaw bone growth and space causing physical hindrance. 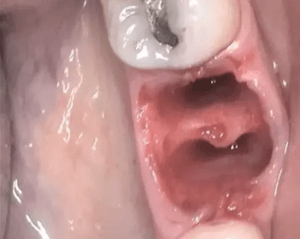 Due to obstruction in their path of eruption in the mouth, tilted and rotated wisdom molars present which often cause infection and swelling of surrounding gum tissues. Infection and swelling occurs especially when food particles cannot be cleaned with daily brushing and becomes accumulated in the spaces between gums and teeth. Severe infection occurs and it becomes necessary to remove tilted, crooked and drifted wisdom teeth by exposing and removing surrounding jaw bone. American Dental Association recommends thorough check up of wisdom teeth around 16-19 years of age and their early removal if necessary to prevent serious side effects in future. Damage to nerve in the lower jaw. Usually heals and returns to normal in 1-6 months. Patient will experience temporary numbness or partial numbness during the healing period. Wisdom Tooth Removal Surgery should be performed with as little trauma and injury as possible. 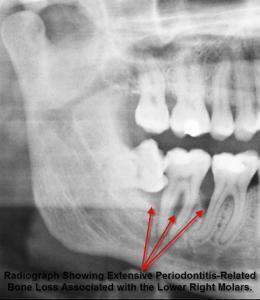 Typical initial wisdom tooth removal surgery usually takes 3-4 days time ranging up to 7-10 days. The estimated length of recovery basically depends upon the degree of severity of tooth impaction, length of surgery time, difficulty of removal and their path of eruption judged by Ct scan and CBCT imaging. If any silk sutures were placed in your mouth, visit after 7 days for their removal. Ozone is a common treatment in a holistic dental office after wisdom teeth extractions. The ozone gas is delivered into the tooth extraction site where it oxygenates the bone and neutralizes acidity and disease and kills bacteria, fungus and other pathogens. PRF is also highly recommended to better the chance of normal jaw bone healing and minimize the risk of bacteria persisting in the pores of the jaw. Do Wisdom Teeth Need to be Replaced with Dental Implants? Rarely, but if a full compliment of wisdom teeth are in a health bite, it may be necessary to replace a wisdom tooth with a dental implant to prevent the loss of another wisdom tooth.